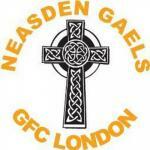 Neasden Gaels held a well attended AGM in O'Sullivan's Bar, Radlett, recently. The outgoing committee and management team were thanked for their contribution and the new committee would like to thank Danny O'Sullivan and Dave Byrne for their contribution over the last two years. Frank Kane was elected unanimously as chairman for 2018 and everybody connected to the club would like to wish him and his new committee well for the year. The Annual Club trip departs this week, with New York the destination. A combination of fresh-faced youngsters and grizzled veterans hope to take on Longford GFC, in amongst other cultural pursuits. We wish them a safe trip. Neasden Gaels would like to wish everyone connected to the club, past or present, a Happy St Patrick's Day. Ghlac CGB Gaeil Neasden áit i dteach Uí Súileabháin (O'Sullivan's Bar),Radlett, cúpla seachtain ó shin, agus slua mór i láthair. Gabhadh buíochas amach leis an choiste agus leis an fhoireann bainistíochta atá ag dul as oifig agus ba mhaith leis an choiste nua ár mbuíochas a ghabháil le Dónal Ó Súileabháin agus le Daithí Ó Broin as ucht a gcuid oibre le linn na dhá bhliain atá imithe thart. Ceapadh Proinsias Ó Catháin ina chathaoirleach d'aon ghuth i mbliana agus guíonn gach duine ceangailte leis an chlub gach rath air agus ar a choiste nua. Imíonn an turas blaintúil an tseachtain seo, Nua Eabhrac mar ceann scríbe air. Measc suimúil de sheanfhondúirí féasógacha agus d'óganaigh friseáilte ag súil aghaidh a thabhairt ar an pháirc imeartha ar Longford GFC atá i gceist, le roinnt imeachtaí cultúrtha eile ag tarlú freisin, gn amhras. Go té siad slán. Beannachtaí na Féile Phadraig le gach duine le nasc leis an chlub, anois nó sa aimsir atá caite.